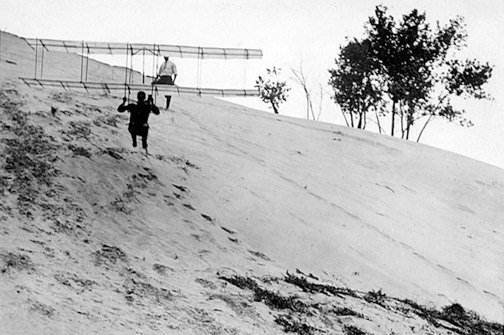 to the Indiana Dunes in the summer of 1896. Chanute's notes on the two visits to the Indiana dunes in the summer and fall of 1896 are a chief primary source for his experiments, along with reports of the experiments that he published the next year in James Means' Aeronautical Annual and in the Journal of the Western Society of Engineers. On this page is the diary along with the footnotes from the published version by Marvin McFarland. The two little drawings inserted into the diary are from the original diary in the original position as published in the McFarland edition. The 3 plates mentioned in the footnotes are plates in the McFarland publication. They are lined up at the beginning of the footnote section. Clicking on the thumbnails will bring the full picture. 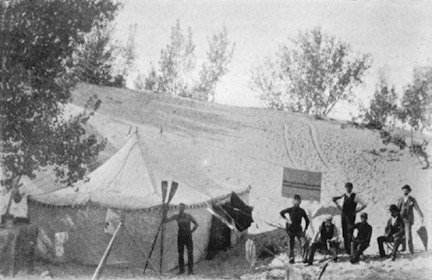 Throughout the diary Chanute mentions taking photographs, as he did on both trips to the dunes. When possible, an appropriate image will be inserted, but it is not known for sure if that image is the one taken at that time although an effort has been made towards proper identification. In all cases, clicking on a thumbnail will bring a larger image or a new page with more details on the glider and additional images. Reached Miller 8 A.M. Took outfit to sand hills and pitched the tent. 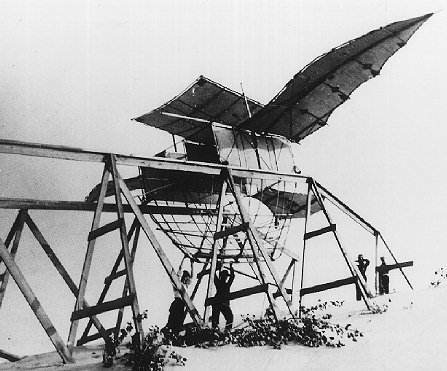 Herring1 erected Lilienthal machine.2 Took several jumps, the longest about 70 ft. The apparatus is cranky, and falls about 2 or 3 horizontal to 1 vertical. Wind N. and steady. Had a number of visitors, one of whom telegraphed to Chicago that experiments were being made. Herring erected 12-winged machine3 The wind was gusty and the machine swerved about so that he could not locate center of pressure. Laid it aside. Practiced with Lilienthal. Got a number of fair jumps. It is a gliding but not a soaring mach[in]e and little is to be expected from it. Wind easterly. Had a reporter from Tribune. Practiced with Lilienthal. Herring got good jumps 80 to 100 ft. Paul tried and was upset. Avery did better but made only short jumps. Tried the 12-winged. Found it steady but lifting too much in front. Tied on 12-lb. bag of sand in front. Got a short flight but machine blew over after lighting and broke. All are afraid because of its novelty. Wind S. East. Experimented with both kites. Visit from Maxfield. Repaired 12-wing machine and reset it as 8-winged.1A Located c. of pressure just under 1st pair. It proves more steady than Lilienthals and promises to soar. Took a few short runs but wind too strong and gusty. Experimented with Herring kite, and produced aspiration.2A Took photos of this. Had a reporter from the [Chicago] Record (Mr. Manley). Tried O.C. apparatus with 8 wings, and found it better balanced and easier to handle than with 12 wings. C.P. about under the center of front wings. Surface was 118 sq. ft. Were afraid to jump with it as the wings seemed too frail to sustain a man of, say, 150 lbs. and 25 lbs. of machine. Made tests of wind currents with down and found it was deflected down ward after leaving wings. As a result began the construction of a kite with circular frame. Rigged up machine with 4 wings in front & 8 behind, the latter superposed to 0.4 their breadth. Found this much easier to handle than Lilienthal & more stable than any arrangement yet tried. Jumped 27 ft. in wind of 7 to 10 miles an hour. Broke projecting stick to which wings were guyed. Repaired in 10 minutes. Wind too light for a full test, but experiment seems promising. At 1 A.M. a wind gust came up suddenly and blew down the tent, which fell partly over Lilienthal machine, while the tent pole fell over the 12-wing machine. Both damaged. Avery put up tent again in the rain, and had both machines repaired by 9 A.M. Monday morning when O. C. & Herring returned from Chicago. Tested 12-winged machine with 4 wings front and 8 behind. Found it better balanced when standing still in wind than with any previous arrangement, but found that the front was insufficiently sustained when in flight (59 sq. ft.). The rear held up better than with wings as previously staggered. Next tested with 8 wings front (118 sq ft ) and 4 behind. Found machine nearly as easy to control when standing still and sustaining much better in flight. Both Herring & Avery made glides of 76 ft against a north wind and pronounced the machine more stable in its present shape than that of Lilienthal. This seems the proper arrangement to adopt, i.e., the supporting surfaces at the front with the load (operator) directly under the center of those wings, and about 1/2 or less surface in the rear to steady the flight and act as a tail. The grouping was as shown below. Got no photograph. Got several good flights out of the Lilienthal-one of 116 ft. Found it out of balance and tried to remedy this by cutting away part of one surface. This made it worse. Had a flight of about 40 ft. at end of which it turned over after alighting and was broken beyond repair. Glad to be rid of it. Raised top wings in 0.C. to test whether the increased leverage of wind would make machine more difficult to control, and whether the increased distance between wings would make the lift greater. Total weight machine 37 lbs., a 5-lb. bag of shot in front. Got these alterations done by noon, but the wind having fallen off to 7 to 9 miles per hour could not test the arrangement in actual flight. Got a photograph.3A Wind light all day, so could not try the machine fully. Got flights of 30 ft. and found it apparently as easy to handle as with the top wings lower down. Thought it sustained the weight better, but could not be sure as wind was 5 to 10 miles an hour. After waiting till 5 P.M. for more wind, took off the upper back wing and inserted it in the wide space under front top surface thus having 5 sets wings in front (148 sq.ft.) and having 1 set at bottom in rear (29 sq.ft.). Called this the "Katydid." Took photo of Katydid, 37 lbs. Found machine quite as steady and manageable. The lift was greater and the head resistance apparently less. Took scores of glides. The best by Herring-69 ft. at a descent of 171/2o or 1 in 3 1/2. Took one photo in flight. Wrapped gunny sacks around the wires crossing above the shoulders, so as to rest thereon and found this a great improvement. The rear wings flex up behind in flight and preserve the fore-and-aft balance. They seem to be in the right place. The machine swings itself into the wind but would be improved by keels. I am well satisfied that this is the type to adopt for rebuilding. Machine can be arranged so as to slip in intermediate wings when the wind is light. Put man directly under the supporting surfaces. Place lower wing 2' 6" above ground. Set wing 7o above horizon. Set top wing o " "
Wind still in N.W. some 8 to 12 miles an hour, or same direction & speed as day before. Made no trials with machine, as we could have done better than the day before. A storm slowly gathered all day, and it rained heavily in the evening & night. Stayed over in hope of a brisk north wind the next day. Northerly wind, 6 to 13 miles an hour. Made a few jumps in forenoon-best one 55 ft. Wind freshened about noon and made a number of excellent jumps. Best one, Avery, 78 ft.; Herring, 82' 6". Quit at 2 P.M.. Packed up and went to Miller. Left on 6:41 P.M. train, sending tent material home by express. Winged machine is more compact and handy than Lilienthal's and it promises to be safer & steadier. 2. Rear 2 wings removed-steadier. 3. 4 sets behind, 2 front- do. 4. 4 sets front, 2 behind-lifts more. 5. " " " 2 " , upper front wing 3 ft. up. A little top-heavy. 6. 5 sets front, 1 behind at bottom. This is the best of all. Angle 17o-say 52 % = 1.50 "
Actual lift 150 + 37 = 187 lbs. Difference probably due to head resistance. Loaded the two O. C. machines on Scorpion at Peshtigo dock, then went to 71st St. pier and loaded Paul's machine. The boat laid up at South Chicago that night. Scorpion arrived off experiment hill at 12:30 P.M. Card's flatboat at hand. Lightered and got unloaded al 1:45 P.M. Pitched the tent and got settled. A fearful storm came up from S.W. at 3 A.M. Blew the tent down and rained very hard. All the party; got very wet and provisions were damaged. Herring's wings blown away and smashed. Camp equipage scattered & damaged. Gathered up and dried things. Sent for another tent and got it that night. Another storm in the evening but cleared up by 9 P.M. O.C went to city. Party slept at fisherman's and did not put up tent till afternoon. This being Sunday, did no work. Began erecting Paul's machine and framing trestle. Herring went to city for new spars for machine (fixed winged). Began erecting trestle. Work progressing on Paul machine. O. C. went to city. Work progressing on Paul machine and trestle. Herring got back in evening. O. C. returned in morning. Work progressing on Paul machine and on fixed wing machine as well as on trestle. Got boat to Dune Park, but could not get it hauled. Work progressing on Paul & fixed winged and trestle. Still no team to be got. Carried over step ladder and some provisions. Trestle completed. Also Paul machine, except the last touches. Herring set up 3-winged machine and tried it, but found it unstable. O.C. went to city with Paul & Jim and Herring went to Michigan City. All parties returned but Jim. Herring cut down 3-winged machine to two surfaces-135 sq. ft.5A Took a number of leaps, the longest 97 ft., and found machine stable and well able to support weight in a 15-mile northerly wind. O.C. called to city by telegram. Paul found he had been hurt by a branch in the woods and came to city to get a truss to support hernia. Practically no work done in camp this day. Paul & O.C. returned to camp. Wind S.E. and gusty, so that no experiments could be made. Opened box to begin erecting O. C. machine but delayed proceeding on account of the threatening weather. Bad blow and rain from the north at night. Gale from north, 60 to 67 miles an hour. Paul called to city by wife's illness. Wind turned to S.E. in afternoon and began erecting O. C. machine. Wind back in north and 15 miles an hour. All conditions favorable. Paul returned from city. False alarm. C.D.C. and Jo Card came down. Also Mr. Macbeth of Times Herald from Miller by buggy. Wheeler came from city on his bicycle. Got out Herring machine in forenoon. Took 10 or 12 beautiful glides. O.C. machine completed. Took it out for the test but it would not lift; needs balancing & overhauling. Paul machine virtually completed. Put on cloths and took it to launching ways to try the fit. Found it bound on edges and shoes did not bear alike. Made alterations. Tested one of the wings with the new angle for guys. Found it crippled with 65 lbs. and spilled the wind. Needs an additional strut. A windstorm coming on; put machine near tent. Wind N.W. Tried O.C. machine but results not satisfactory. Tried Herring machine 3 short glides, but wind veered 90oat noon. In afternoon two storms from N.W. 60 miles an hour. Had to make all snug. Paul's wing strengthened but could not be tested on account weather. Ricketts went to city in A.M. & returned in P.M. O.C., Paul, & Avery went to city, leaving Herring & Ricketts in camp. No work done in camp. Avery came to O. C. house at 10:30 P.M. to say his girl was sick with typhoid fever and he would be unable to come down next day ($20). Paul met O.C. at depot to say his wife had been confined of a boy and was very feeble so that he would be unable to come down that day. Went on to camp. Wind from south 25 to 40 miles an hour & gusty. No experimenting can be done. Tribune reporter (Bunting) arrived about 6 P.M. Got account of past experiments & telegraphed them from Dune Park. Returned to tent at midnight. Paul arrived in A.M. with Maxbeth, Times Herald reporter, the latter chagrined that the Tribune had "scooped" him. Wind still south, 20 to 40 miles an hour, so that no experimenting can be done. Both reporters; left in evening. Avery telegraphed in P.M.and arrived at 5 P.M.
Wind still in south, 20 to 30 miles per hour, and gusty. Tried to test O.C. machine for wing movement. Suspended it between two trees. Found that by throwing wings forward an ascending pressure was obtained. Herring raised by a wind gust, in which post of rear wings was broken. Chronicle reporter came and went back to Miller. Wind still in south. An absurd article in Chronicle leading to a press report that party had been tossed up into the air. No testing could be done. Made some changes in O.C. machine. Paul called to city in P.M. by a telegram about his baby's eyes. Wind in north, 22.3 miles pr H. Tested O.C. machine. Herring 148 ft. 7 sec. Avery 174 " 7.6 sec. Herring 166 " 7.5 sec. Avery 188 " 7.9 sec. Herring 172 " 7.8 sec.
" 220 " 9. " " 235 " 10.3 "
Both machines make steady flights. Herring once raised suddenly & turned out of course. Laid this to stop cords and cut them. Machine seemed to work better thereafter. Paul telegraphed that he was coming down but did not arrive. Wind N.E, but veering. Put plane further back on O. C. machine but did not test it. Worked with Herring machine in A.M. but made no great progress. Wind set to north about noon. Paul returned 9 A.M., worn out with two sleepless nights. Made him lie down. When wind turned to north told him he might proceed with erection of machine. This was completed by 4 P.M. by which time a heavy fog had settled on lake & land. Wind 25 miles an hour & gusty. Deemed experiment unsafe and took off sails from machine. Herring went off, instead of helping in preparations and used his machine. Got a number of very good glides, the longest being 359 ft. and 10o. O. C., Paul, & Avery went to Chicago. Charles was out and tried machine. Ricketts & Herring in camp. Mr. Manley of the Record came out to make sketches. Met at hill by Mr. Herring who told him his story of a disagreement with O.C. for publication. Took the photo from plate holder and another photo of the ground over which he had glided and got them developed on a steam launch stranded in the vicinity. Then he packed in with his effects and took away next morning. Wind east in A.M. changing to northerly (28 miles per hour). Got Paul's machine up the hill and into the ways. Tested it for fit and tallowed the ways. Took it out and staked it on plain while at lunch. Put it in the ways again in P.M. Paul got in it and tested its balancing. Was lifted 2 1/2 ft. above ways and determined that the machine was under control. Concluded the center of gravity was about where he wanted it and the lifting power ample. Got main rope and guy lines out to launch it off in ballast from the ways and test it as a kite about 5:30 P.M. but having discovered a small rip in one wing and a buckling of a brace thought it more prudent to take machine from ways & anchor it for night on the plain. Wind changed in night and blew from S.W. Mended the machine and got it ready to fly as a kite on the plain when a threatening squall at 2 P.M. determined taking it down the hill to the tent. In afternoon tried O.C. machine with plane placed further back of wings; found this an improvement. Then tried plane with the convex side down and found this diminished the lifting power, but increased the steadiness. Wings are too much racked, however, to exhibit what the machine will do. It is now arranged with fixed wings and does not display what can be done by hinging them on a vertical pivot. Wind from north 17 m. per hour at 8 A.M., decreasing to 12 m. per hour at noon. Got Paul machine up the hill and into the ways. Tested it for fit and rigged it as a kite with a bridle lead ing down to a long rope to a post 25 ft. from chute, thence at right angles through a swivel, to serve as line, with two side guy lines fastened to the wings, and with loose rope hanging from front and rear machine to change the angle if required. All being manned, O.C. cut rope at 12:35 P.M. Machine slid down the ways and took the air fair & level. Went horizontally 15 or 20 ft. and then (being checked by friction of main rope in the sand, which the crew did not haul in fast enough) it settled down squarely forward and westward to the ground, landing on its keel about 100 ft. from end of chute. One wing struck the ground and was not broken. Found 4 broken stanchions (at keel) but so little damage done that all was repaired in 2 hours, by which time wind had become so light that machine could not be sent off again. Took it back to tent. O. C. returned in A.M. Rainstorm set in and poured all day. No work could be done. Stayed in tent. Wind rose from N.W. at 2 A.M. This is the equinoctial. 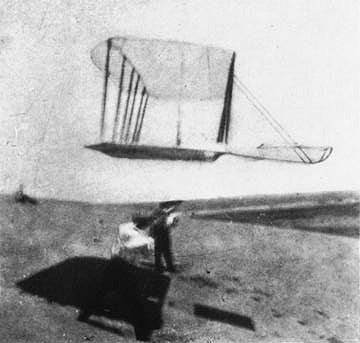 Blew 31 to 38 miles an hour at 8 A.M. and 56 to 61 miles an hour at 11 A.M. Machine stood at back of tent with all sails spread and was tossed by wind which broke the midrib in left wing (the one which struck the ground) and broke two sticks in aeroplane. Took off the sails in order to repair damages. O.C. & Avery went to Chicago and Paul & Ricketts stayed in camp. No wind, an Indian summer day. Paul finished repairing his machine, which is now stronger than ever before. O.C. & Avery returned from city in A.M. but no tests can be made for lack of wind. A violent gale from the north began in the night and blew all day-60 miles an hour at 9 A.M. and 45 miles an hour at noon. Nothing can be done. Reporters of Sunday Times Herald and of Boston Herald with an artist called to get data for articles. Gale blew itself out in the night, and turned to a south wind by morning, 8 to 17 miles an hour. Got Paul machine up the hill and tried to raise it as a kite, first from the sand and then from the trestle. Found the wind not strong enough, although when on the incline the machine raised in front so that only the rear shoes remained on trestle. Then tested machine the whole length of chute for fit of sliding shoes which proved all right, and took machine back to camp. In afternoon tested keels on both 2-winged & 10-winged machine, but the exposure was bad for the south wind and no good results were obtained. Wind from S.W. a gale. Blew all day and no work could be done. Wind from S.W. a gale with rain. No experimenting can be done. S.W. gale ceased in night. Very still in morning, with indications of a north wind. This set in at 8 A.M. 3 miles per hour, increasing to 10 m. by 10 A.M. Got all ready to test Paul's machine. Got it up to the slide in the afternoon. By 3 P.M. wind 18 m. an hour. Paul in machine and all ready. Cut the rope at 3 P.M. Wind turned to N.E. Machine slid down slowly on the chute and stopped on level portion, the two forward shoes clear of slide. This must be due to friction on slide consequent on side wind. Fastened a rope at once to back of machine, and hauled it back to top of slide. Told Paul to get out before hauling back. Substituted 90 lbs. ballast. Fastened ropes to front and rear of machine & manned them so as to give initial velocity. Sent machine off again at 3:30 P.M.
As soon as the front of machine had fairly left the chute, the side wind blew the head around and the apparatus took a descending S.W. course, describing a curved path. The left wing struck the trees west of chute, the tip struck the sand and the wing was broken, this being chiefly in the main center arm. The machine fell to the ground and a number of ribs and stanchions were broken. The rattan did not break. If the man had been in the machine, he would have not been hurt, but this trial determines clearly that the machine will not perform soaring flight, that it will glide downward only, probably at a maximum angle of 1 in 4 as shown by calculation, and that the head resistance & drift must be reduced so as to give a descent of 1 in 10 (6o) before it can be hoped to raise on the wind higher than the starting point. This has not been accomplished with any of the 3 machines. Determined to break up camp to terminate the experiments for this season. O. C., Avery, and Ricketts came into town, leaving Paul. The persons who figure in this diary as assistants of Chanute's are: Augustus M. Herring, formerly one of Langley's assistants at the Smithsonian Institution; William Avery; Paul Butusov, a young Russian aeronautical enthusiast who had built a gliding machine from which he claimed to have had rather extraordinary results; and James Ricketts, a young Chicago physician who according to Chanute, "had a slack practice and a taste for aviation. " 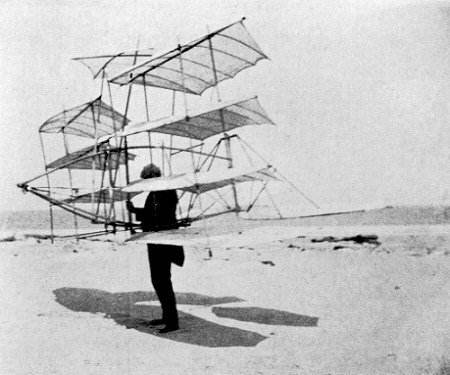 A reproduction, built for Chanute by Herring, of Lilienthal's best-known glider - a single pair of birdlike wings with an adjustable tail at the rear. Pilcher, the English experimenter, used the same type. Usually referred to as the "multiple wing" machine. As will be noted, the number and arrangement of the surfaces varied. Also called "O. C. apparatus" to distinguish it from the "three surface" (later "two-surface") glider built for Chanute by Herring and referred to as the "Herring machine." 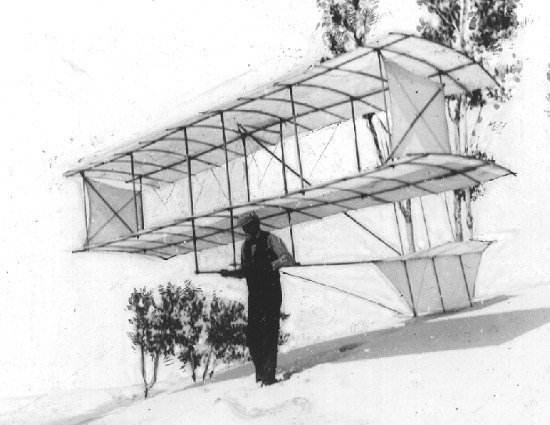 In Progress in Flying Machines, p. 9, Chanute defines aspiration as "a mysterious action . . . by which a body acted upon by a current may actually draw forward into that current against its direction of motion." This phenomenon is illustrated in Plate 23. In the Chanute Papers in the Library of Congress there is an album containing prints of all the photographs taken during the experiments of 1896 and 1897. Most of the better ones were published by Chanute as illustrations to his aeronautical articles. 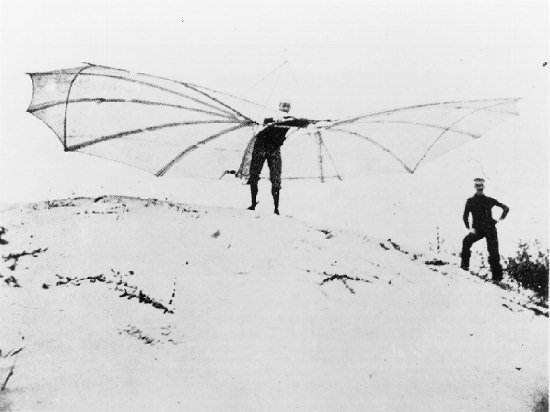 The view of the two surface glider shown in Plate 11 and the multiple wing machine shown in Plate 10 are the only examples of the Chanute photographs of 1896-1897 reproduced in this work. This figure is clearly 2.90 though it has been partly erased, undoubtedly by Chanute when he noted his error in multiplication. 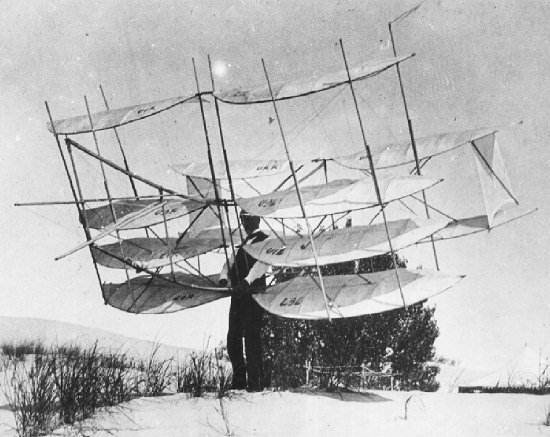 This marks the emergence of the Chanute two-surface apparatus with the familiar Pratt-truss construction which the Wrights later adapted for use in their early gliders. (See Plate 11.) The structure of this machine is responsible for the widespread impression that Chanute invented the biplane. Actually, the reduction to two surfaces was hardly more than a momentary expedient, for in his next machine, the oscillating-wing, Chanute went back to the three-surface design he preferred. This preference is stated by him in a letter to Samuel Cabot, Sept. 29, 1897: "Mr. Herring says he built a two-decker, instead of a three-plane machine, for Mr. Arnot because it is cheaper.. . . I would advise a 3-plane machine rather than a double-decker...."
This glide was made on September 12 (see below) but was added to the list of glides made on September 11, perhaps at a later date. 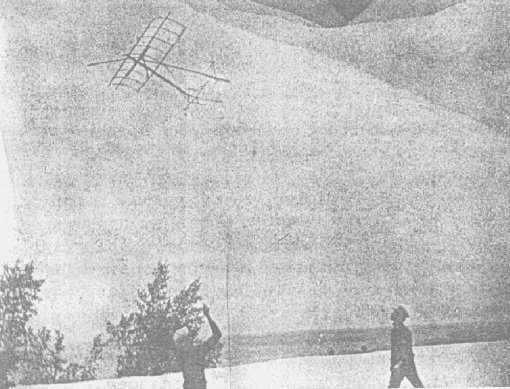 The data for these glides were included in Chanute's letter to Wilbur Wright, Aug. 17, 1903. "I have your letter of 17th, and much regret to find that, upon reflecting on the subject, you think that I have not done you sufficient justice in my writings. "It is natural for every man to overvalue his own achievements. I do it myself, but the following is my own understanding of the facts. "lst. While we were still in camp I made and gave you, on cross-section paper, a sketch of the two-surfaced machine with a Penaud tail to serve in building the 1896 machine. This you assigned as a reason why I should join you in applying for a British patent at the time that I disclaimed any share in the design of the propelling arrangements. "2nd. You applied an elastic attachment to the Penaud tail. This at the first trials proved a failure, whereupon Mr. Avery, as he says, proposed the present arrangement, which proved a success. You have not given Mr. Avery credit for this; neither have I. "3rd. It is my understanding that the 1897 machine was similar to that of 1896, so that the photographs may be used indiscriminately. "4th. I do not claim to have made any invention at all, but simply designs to study automatic stability. This I hold not to be fully secured in the two-surfaced machine as the operator has to move during the glide. "5th. Upon partial success you left me three years ago, as I then believed, to be alone in reaping future rewards, and this scarcely entitles you to having me blow the trumpet for you. "6th. Notwithstanding this, I have given you more credit than any other person ever did. I modified my own article in the Aeronautical Annual of l897, so that you could tell your own story, and dissuaded you from withdrawing your article when Mr. Means edited it. I invited you to a joint talk to the Chicago Engineers, and when I was asked by McClure to write of my own experiments, I mentioned your name. I did not mention Avery or Butusov. "7th. You invited me to St. Joseph to see you repeat the flight of 50 ft which you had previously made, but you were unable to do so. You now say that you have privately made another of 72 feet, but such performances must be repeated many times to be convincing. 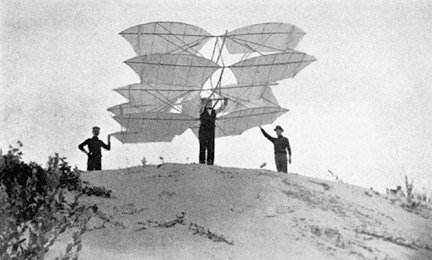 Lilienthal made 2,000 glides, Pilcher and ourselves perhaps half that number each; Tatin, Hargrave, and Phillips each made many. "8th. I scarcely think that what you have accomplished during the last three years would warrant me in setting your work above that of Tatin, Hargrave, Ader, Langley, and others, as you seem to desire. It is a question of judgment. Go on and demonstrate some important results and there will be no lack of appreciation in my writings." Throughout these web pages, and in Chanute's writings, the location of the second experiments is called 'Dune Park'. It is difficult to locate the exact location of these experiments on the lake, but I'm pretty sure that they were on land now occupied by Midwest Steel just east of Odgen Dunes. The name 'Dune Park' was the name of a stop on the now extinct Lakeshore and Michigan Southern Railroad. It should not be confused with the current day Dune Park stop on the South Shore Railroad that is just east of the Indiana Highway 49. McFarland was the head of the Aeronautics Division of the Library of Congress when he edited and published the 'Papers' in two volumes, Volume 1 covering 1899-1905 and Volume 2 the years 1906 to 1948. The Chaunte Diary appears in the first volume. Thanks to Ms. Simine Short for transcribing the diary into a digital file and helping with the images.